Second in a duology, Laini Taylor’s award-garnering Muse of Nightmares is best enjoyed after reading the first book, Strange the Dreamer. Muse of Nightmares starts where the previous book left off. Cinnamon-haired Sarai had fallen from the gigantic seraph that looms over the city of Weep. She died when she landed, heart impaled on an iron fence, red blood flooding from her blue body. Sarai’s ghost emerged from her shattered body and gazed up at the home that seemed forever lost. Minya is set on using her ghost army to kill the villagers of Weep. For decades, gods and goddesses had lived in the seraph, stealing young wives and the occasional young man to bear or sire their children. It seemed fair enough for the Godslayer Eril-Fane to lead villagers into the seraph and kill the gods and goddesses for their depravity. But they went too far when they began killing the half human, half god children as well. They had been so innocent, so small, their gifts not yet developed. Six-year old Minya could only save four. The villagers were sure all the children died, so they’ve lived in the seraph for the past 17 years without harassment. The scope of this brilliantly imagined story is breathtaking. In it we cross dimensions and enter worlds never before seen where the thousands of godspawn children who came before Minya and Sarai were sorted and sold according to their magical gifts. Some control fire or clouds or free will. Only a few are strong enough to navigate the portals between the worlds that lay stacked one atop another like pages in a perverse book, separated by portals nearly impossible to navigate. As Sarai, Lazlo Strange the dreamer, Minya, and a handful of others struggle to understand what’s going on, we meet Kora and Nova, two powerful sisters separated hundreds of years ago, one to become an avenging legend, and the other doomed to search through time and space for the only person she’s ever loved. Kora had been responsible for stealing and selling hundreds of godspawn children, although unwillingly and only in return for the promise to save Nova’s life. Can Sarai, whose gift is entering dreams and bestowing nightmares upon the sleepers, turn her gift to good? 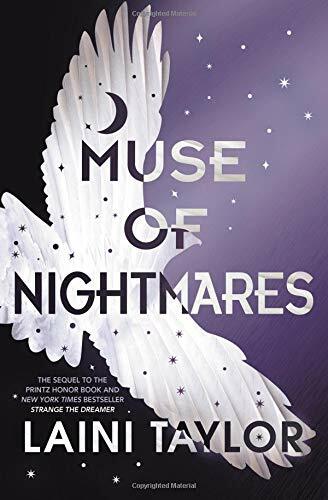 She enters Minya’s dreams to discover the fear, horror and hatred that cause her to snag ghosts before they disappear and turn them into her own avenging army. Nova dreams only of violence, and of searching through endless worlds for her lost sister. Minya and Nova both need saving as much as the Godslayer had. The story’s unexpected twists and revelations make it difficult to put down the book. The suspense ramps up as secrets are revealed until the surprising and satisfying ending plays out.